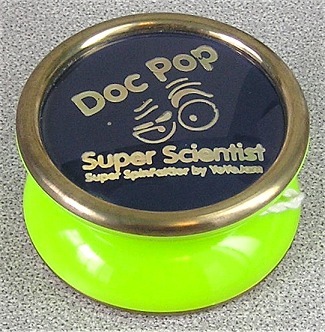 This is the first of the signature models made by YoYoJam for Doc Pop. It is a standard Super SpinFaktor with Brass colored weight rings, and in a bright neon Lime Green with Dark blue side caps. Super SpinFaktors were having problems with cracking at the weight rings, so this was made in a opaque plastic more resistant to cracking, and does not show the micro cracks. While there is technically no response system, the molding circles around the axle worked as a very weak starburst response.